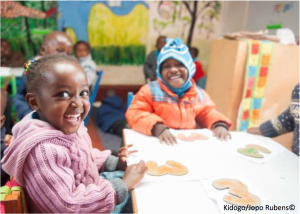 The last two decades have shown great political commitment and investment in early child development (ECD), as the third Lancet ECD series, ‘Advancing Early Childhood Development: from Science to Scale’ emphasised the need to focus on how to implement at scale. Moving forward, UNICEF’s ‘Early Moments Matter for Every Child Report’ has called on governments and partners to action with the addition of the soon to launch report Nurturing Care: Framework for Action and Results, led by UNICEF and WHO and the support of Partnership for Maternal Newborn and child health (PMNCH) and Early Child Development Action Network (EDCAN), aiming to provide support to the processes of scaling up ‘nurturing care’ interventions. This moment therefore marks a ‘tipping point’ for ECD as the global health community embraces this shift in the ECD agenda towards multi-country large-scale implementation. With this in mind, there is a need to ensure that policy processes for programme and implementation efforts remain evidence informed. MARCH members Joy Lawn and Kate Milner with co-authors from UNICEF, WHO and Grand Challenges Canada published a short paper in Bernard van Leer Foundation on ‘Learning from Saving Brains: informing policies and scaleup for early childhood’. This paper embraces the unique opportunity to inform processes and understanding towards scaling for ECD through lessons learned from the Saving Brains portfolio, a partnership led by Grand Challenges Canada across 31 low- and middle-income countries which aims to develop scalable and sustainable ways to nurture healthy brain development in the first 1000 days. Using qualitative methods in the evaluation of the portfolio, feedback highlights that there is immense value in investing in leadership and development that extends beyond grant cycles. This involves building coalitions of diverse stakeholders and strengthening South-South knowledge sharing for long-term policy influence. Qualitative feedback of the Saving Brains’ evaluation underlined that training and reporting requirements provided stakeholders with a ‘common language’, which acted as a key strength of the portfolio as it allowed stakeholders across sectors and country contexts to connect through internal consensus on the framing of problems and solutions. However, there remains a disconnect between language used by researchers and implementers – highlighting a need for more clear definitions of ‘what’ and ‘how’ for implementation. Better consensus on key definitions of challenges and solutions will be important for large scale adaptation and implementation of ECD interventions across settings. While important progress has been made in global child development metrics, such as Saving Brains’ supported development of WHO Indicators for ‘Infant and Young Child Development’ (IYCD) and the Caregiver Reported Early Development Index, there remains a great challenge in measurement of effectiveness across settings, of implementation, and of outcomes in response to interventions (McCoy et al., 2016; Yousafzai et al. 2014). Increased attention to metrics is needed to understand and measure impact. As we focus attention from global to local, we must take greater measures in investing in the early years of life for a healthy and productive future. Therefore, scaling up necessitates evidence informed processes and measures to support every child to thrive. We look forward to the publication of a series of papers discussing scaled implementation of ECD interventions, led by the MARCH Centre with partners and co-authors from various organisations, later this year.